TAVISTOCK’S Oliver Woodmason and Erme Valley Harriers’ Olivia Travers were among the athletes to set new personal bests at the BMC Regional Meet at Exeter on Tuesday evening. Woodman, in his first season at under-15 level, ran 4:46.15 for the 1,500m. 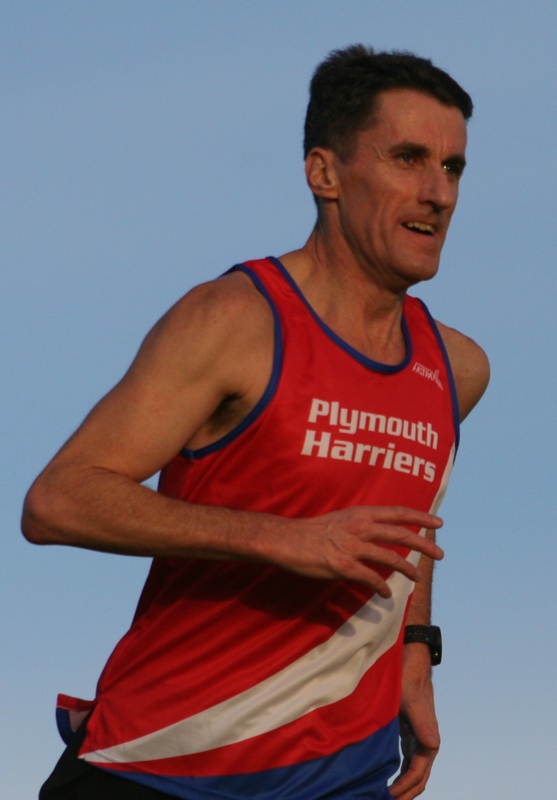 Plymouth Harriers’ John Porter (pictured), who is in the over-45 category, was the top finishing athlete from the region in that event with a season best 4:19.23. Tavistock’s Dan Luckham, an under-15 athlete, clocked 5:08.17. Travers, another under-15 competitor, ran under the 2:30 barrier for the 800m for only the second time. The Erme Valley youngster clocked 2:29.24 in the women’s two-lap event, which was more than half-a-second quicker than her previous best. Tavistock’s under-17 competitor Jenny Milburn ran a season’s best of 2:20.15, while her under-17 team-mate Emma Ryder clocked 2:24.54. Erme Valley Harriers’ Liam Hallows ran a PB of 2:13.34 in the men’s 800m, with Tavistock’s Joe Dix, an under-15 competitor, stopping the clock at 2:25.26. Meanwhile, Tavistock’s Jade Kinsey was among the athletes to impress at the UK Youth Development U17/U20 Midlands Premier South/West match at Cheltenham. Kinsey won the under-20 women’s A 400m in a new PB of 58.2. She also ran 26.6 seconds for the 200m. Her club team-mate Joely Bytheway took victory in the women’s A under-20 400m hurdles in 70.0 seconds. She also won the B 400m flat. Other notable performances came from City of Plymouth under-17 athlete Erin Spiller, who clocked 12.9 seconds for the 100m and a season’s best 26.4 seconds for the 200m, and Mia O’Daly who threw 32.93m to take third in the under-17 discus and threw 9.36m in the shot. Throwers Lois Fielman and Zoe Crutchley also made their mark in Cheltenham. Tavistock’s Fileman took second in the under-20 women’s discus with a season’s best 25.50m and took third in the under-17 hammer with 37.56m. City of Plymouth’s Crutchley came third in the under-20 hammer with 28.47m. Elsewhere, City of Plymouth’s James Arnott had a busy few days. He ran 11.39 seconds and 11.59 seconds in two races at the England Athletics IPC competition at Bedford at the weekend. The Great Britain para-sprinter then ran 11.47 seconds at the Newnham Network Open on Monday.